This is old information and kept here for historical purposes to show the process that was gone through. It details the objections to having it classed as housing and the Government Reporter view (copied in directly below here) that the Housing Proposal should be deleted. The City Development Plan has therefore been updated with North Kelvin Meadow new status. towards meeting the shortfall in the provision of land for new housing in the City, which we have identified as a deficiency in the Proposed Plan in Issue 17. However, the land at Clouston Street is a highly valued open space which is well used and maintained by the local community, and which should continue to be safeguarded for that purpose. Its development for housing would be in conflict with planning policies which seek to protect such areas. I have therefore decided to modify the Proposed Plan by deleting Housing Proposal H023. land supply for the plan area. Ministers would be required if the Council wished to dispose of land in use as a common or open space, or held for allotments. positive placemaking, fostering adaptability by integrating a mix of compatible uses and communities, and thereby improving community cohesion. The Main Issues Report noted the SDP Proposed Plan conclusion that there was more than enough land supply to meet demand. 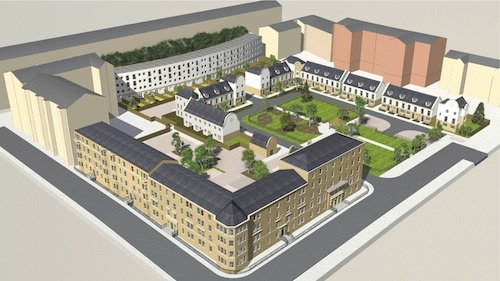 The site has never been allocated for housing before. It was not included as a proposal in City Plan 2, so cannot be carried forward into the Local Development Plan. Inclusion in the 2012 land supply is not an adequate justification for its allocation as a proposal in the Local Development Plan. The Local Development Plan should accord with the Strategic Development Plan, which expresses a preference for the development of brownfield land. consultation is required before pitches can be disposed of. demonstrated in its designation of Green Year in 2015, and would be contrary to policy for the historic environment. issue due to the density of the existing housing. permission was previously rejected by a Scottish Office Reporter in 1996. 00657 – The impact of the development on listed buildings bordering the site has not been assessed. Following a long period of neglect by the Council, the site has benefited from significant investment by the community, and is currently used for a range of community activities, including: nature education for children, allotments, jogging, dog walking, informal outdoor play, local events. Links with local schools and nurseries have also been developed through use of the site. The site is highly valued to visitors and people from other areas, contributes to a safer and more cohesive community, and could be a resource to the area in the long term. These activities are consistent with the Council’s objectives on access to open space, educational, cultural and leisure pursuits, and local food production, and contribute to addressing ill health, obesity and deprivation. Availability of allotments has reduced over time, leading to a waiting list of 8 years in the local area. would therefore be contrary to the aims of the CDP in relation to the natural environment. As this is a tenemental area, most people don’t have gardens. Consultation in relation to the proposed development has been limited to the design of the development, and has been inadequate. It has not taken account of the views of the local community and representative groups, who objected at Main Issues Report stage, and remain overwhelmingly opposed. The numerous schemes that have been proposed over the years mean that the ability of the community to move forward with the site has been put on hold for some time. everyone. Development of the site would affect the poorest most. services cannot support further development in this area. It is also a carbon sink. importance of exercise to health and well-being for the community and its children. 00111 – The community aims to protect this space for the benefit of future generations. 00133, 00569 – The main justification for development of housing on this site is profit. discussions with sportscotland in relation to subsequent proposals for the site. erection of 95 flats and new sports park facility comprising multi-purpose games courts, jogging track, sports pavilion and lighting columns. This application was withdrawn on the basis that the predicted noise levels breached recognised limits due to the proximity of the proposed sports facility to housing. subsequently submitted a Pre Application Notice (Ref 10/02988/DC) in 2010, followed by an application for full planning permission in 2012 (Ref 12/00924/DC). The latter application will be taken to Committee in due course. requirement to identify additional sites. The site has been continuously included in the housing land supply since 1995, when it was first marketed, and has been continuously effective since 2007. This demonstrates the Council’s view that the site has been a housing opportunity for a significant period of time prior to its temporary occupation. The site contributes towards the provision of an effective supply of land for housing, in compliance with Scottish Government policy. development in the Proposed Plan. This was not a requirement for City Plan 2.
therefore taken into account in reaching the conclusion set out in the Main Issues Report. included in the land supply are identified in this way to reflect their potential for housing. development must be considered against the relevant policies of the development plan. fully restored, as it remains a housing opportunity for the Council. terms of Policy ENV 1: Open Space Protection. groups and interested parties as part of the Pre Application Notification (PAN) process. requirements of Policy ENV 1. Meadow Green Space Initiative before June 2009. The group subsequently created a temporary community open space. This was without the permission of the Council. proposed housing is not a matter for the City Development Plan. the conservation area will be addressed through the planning application process. The profit that would be made by any developer is not a planning matter. 00543 – Comment of support noted. blaes pitches. It has generally re-vegetated with little sign of any former pitches or courts. There is open scrubland in the centre with mainly immature tree cover round the edges, but the 17 mature lime trees alongside the Clouston Street boundary are the subject of a Tree Preservation Order. There are well-defined footpath entry points and paths within the site. There is a small ‘orchard’ area where fruit trees have been planted. A children’s play space has been constructed in Birch woodland. Raised vegetable beds and half barrel planters have also been placed within the site and there are composting facilities. application ref: 15/01223/DC lodged by The Childrens Wood c/o Emily Cutts on 21 May 2015.
council’s) intention since around 1995 that the former playing fields site be developed for housing. However, no planning permission was granted for residential development during that period – nor was the site allocated for housing purposes in the development plan (see paragraph 12 below). Indeed, the land at Clouston Street is shown as protected open space on the council’s Open Space Map, albeit it is shown as Category 97 ‘a housing site affecting protected open space’ on the key. calculations does not change the planning status of the site. the application for determination by Scottish Ministers. resulting in registered charities and their own planning application. brownfield sites are available as a preference to greenfield sites. However, at Issue 17 above we have concluded that there is a clear shortfall in the housing land supply for the Proposed Plan period. The land at Clouston Street has been identified by the council as being an effective housing site. Omitting the site as a housing allocation in the Proposed Plan would add further to the shortfall. This is a significant argument in favour of the proposed allocation. as a facility meeting local needs. Principle Area. However, City Plan 2 Policy DEV2 is a general policy encompassing the main housing districts of the City, and not a specific policy applying to this particular site. Policy DEV2 of City Plan 2 is explicit that proposals impacting on green/open space should be assessed against the relevant policies (DEV11 and ENV1) which contain a strong presumption that all such public and private green/open space should be retained. shown on Figure 14 (and identified on the council’s Open Space Map). Those categories include public parks and gardens, amenity space, playspace for children and teenagers, allotments and other functional greenspace – all of which are provided in the protected open space at Clouston Street. open spaces they need” (page 23). projects and strategies have received support and awards. appear to be the result of natural regeneration, and provides a habitat which connects with the green corridor of the River Kelvin and is part of a network of green areas in this area of the City. It is likely that mature trees and a large amount of the emerging tree cover would have to be removed to accommodate a housing proposal of any significance. The loss of mature trees in this location could have an adverse effect on the established character and appearance of the Glasgow West Conservation Area where the site is situated. Representations advise that the site is within an area of deep inequalities, with the meadow and wood used by everyone, and that many residents live in flats with little or no access to a garden. That indicates that the upgrade of sports pitches at North Kelvinside would not be satisfactory compensation for the potential loss of the community open space at Clouston Street; nor would it be possible to recreate the existing facility within a new housing development on the land. cater within the site for its own parking needs. design a development of an appropriate layout, scale and massing that would preserve or enhance the setting of any surrounding listed buildings. applied to development management decisions and that drainage assessments will be required for areas where drainage is already constrained or otherwise problematic, or if there would be off-site effects. Glasgow City Council (GCC) has a document called the City Plan that lasts 5 years which details what land is zoned for within Glasgow. We’re currently in City Plan 2 and have given are views on what should be contained in the forthcoming City Plan 3 for the North Kelvin Meadow and the Children Wood. Its policy that the Council ask people’s views on this zoning as it could directly affect them and better decisions are made when asking the people that live in an area what they think. Unfortunately what the Council have done is stuck to the same zoning as they had for this land as before i.e. housing. Many hundreds of people wrote in and explained in detail (see below for many of the points) why this land be zoned as an open green space. So far their views haven’t been taken account of, nor have they been told why the points they have made weren’t valid. The Scottish Government has now stepped in and appointed a person (Timothy Brian) to review what has happened here and report back to the Scottish Government. This is important as the Council owns the land, owns the planning dept, and will benefit by the sale proceeds. We need someone independent that can review this. They also don’t have any policy stating they should be selling of this land if its being used by local people for any open space activities. In other words they are simply selling it off for the money. And while there is nothing wrong in the council selling of city assets for money , there is for this type of land. As their policies actually state they should be supporting the land and the people managing it , not wanting to destory it. To help show the Scottish Government appointed person (Timonthy Brian) the strength of feeling that people would like this land kept as it is and not sold off for housing we have started a petition. Please sign it below and forward to your friends and famly. UPDATE Feb 2016: Please sign the other petition on the front page as things have moved on from this one. Having said that this report Mr Brian will have done would make very interesting reading if we could see it. The reasons stated below are just examples so feel free to come up with your own words if you like. All representations on the Proposed Plan must be received by 4pm on Friday 27 June 2014. Anyone wishing to make representations must do so using the representation form. By using this form, you will help to ensure that your representation is fully understood and that the issues raised are presented in a format consistent with the development plan examination procedures. Try to keep your points under headings so it’s easy for the Council to group the comments. The Council cannot accept representations which do not have a name and postal or email address. developmentplan@glasgow.gov.uk. You can print or photocopy the blank representation form. Representations should be concise (no more than 2,000 words plus any limited supporting information), and should fully explain the issues that you wish to be considered. Pictures can be included in supporting documentation. On-line: electronic forms can be completed and automatically submitted at: http://www.glasgow.gov.uk/developmentplan Tip – write it out first in a Word / Pages document and then copy and paste it into their form. And “Schedule of proposals” look for Ref H023. In the Form (link above) tick box: Proposed City Development Plan. It’s a Green Place – As it’s a wild natural green place within a well built up area, it brings health and happiness to all ages that use it within the local community. Its always been used by the community and has never had building on it. In the past it was a Playing Field and Sports ground, until the goalposts were removed by the then Strathclyde Regional Authority. It’s a safer community – There are a variety of formal and informal community groups and individuals that use the land which connect people from all walks of life. They say just knowing a few people on your street helps communities become safer as people look out for each other. As North Kelvin Meadow is managed by the local community it’s enabled that over many years. It’s a place for kids – Kids benefit both mentally and physically from playing in a natural green environment. It gives them something that classrooms and indeed formal gardens don’t. 4058 (0.57), 4493 (0.63), 2696 (1,67), 4176 A&B (1.24&0.41), 2982ABC&D (1.58,1.86,1.72&0.57), 4401A&B(2.14&0.57), 4128(1.45) and more. (iii) The plan is also supposed to be in accord with the Glasgow and Clyde Valley Strategic Development Plan (May 2012) which states (Para 4.72, p.42) “the SDP requires priority to be given to the recycling of urban land by using brownfield in preference to greenfield sites”. It should be noted that the Scottish Office appointed Reporter, A. G Bell who on 9th Sept 1996 rejected planning permission being given on this land. Recreation – the land has always been used for recreation in one form or another and that should continue. Especially now as there is less land for this than previously. Many people enjoy having picnics, walking their dogs and simply spending time relaxing on the land. Biodiversity – This land has a huge variety of species, as much as a country park we are told. A housing development would result in the loss of a 1.4 hectares green space containing at least 480 trees and countless other species for which compensation for the loss of green space and the horticultural and recreational activities can’t be made as no other land in the area is available. Flood Protection – This natural green space has helped deliver flood protection in an area that has had many flooding problems. 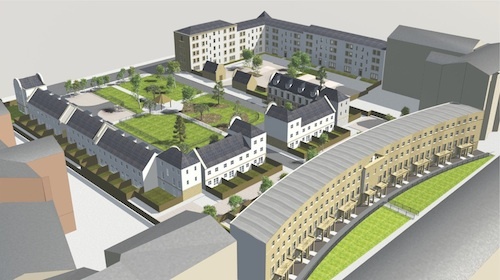 Building more flats on the land and especially with the recent other flat developments in the local area would increase the problem which can be felt as far away as the drainage system on the walk ways of the River Kelvin. Green Network – the land should be a priority as it’s the last large green space that’s not a formal garden or park in the West End of Glasgow. It forms part of a network of green areas from Botanic Gardens to North Kelvin Meadow to Canal area to Ruchill Park. It therefore brings better linkages between these sites and acts as “stepping stones” for migratory species. Natural and Historic – No one walking across the land could help but see just how much mother nature has made its mark. The tennis court that is now a Wood, the sports surface that is now a Meadow. It’s always had a history of serving the community and people would like that to continue. Building flats would destroy that link with its past. Glasgow West Conservation area – Its been part of that conservation zone since Augusts 2011. All trees and open green space are protected within a conservation zone. The City Development Plan mapping says its in a conservation zone yet one of the supporting schedules isn’t updated to reflect that. Delays – The local community have now been in suspension for 21 years whilst various schemes (from Miller Homes, Compendium Trust to New City Vision Ltd) have been proposed and either rejected or never formally put. This is surely unfair and unacceptable to the local community. Glasgow City Council executive stated it was surplus as a sport pitch back in 1993. However they never did a public consultation of what it should be used for, which is against their own X Blaes Sports Pitch Policy. No consultation – There has never been any consultation on what the land should be used for. All that there has been are consultations on what kind of housing. This is against Glasgow City Council policy on having consultations when taking away from a community its sports pitches or green space. In page 6 of the City Development Plan it is claimed that “The Plan has taken into account the comments received from organizations, local communities and individuals in response to the Key Issues and Options set out in the Main Issues Report . .” . Open letters of support from Alistair Grey and other distinguished people in Glasgow. Motions of support tabled at The Scottish Government in Holyrood. Finalist at the Evening Times Street Ahead awards in 2012. Given in conjunction with Glasgow City Council as the Best Environmental Initiative. Certificate of Merit as part of Beautiful Scotland’s Neighbourhood Awards. Resolutions from Kelvinside Allotments association and Glasgow Allotments Forum. 296 objections from individuals responding to the Main issues Report in 2011 which were “overwhelmingly in favour” of it not having it zoned for housing. The site has never been allocated for housing development before – The site’s inclusion in the agreed 2012 private sector housing land supply is not an adequate justification for its allocation as a housing proposal in the Local Development Plan. The site was not allocated as a housing proposal in City Plan 2 so it cannot be carried forward as a housing proposal into the Proposed City Development Plan as a matter of course. “It should be recognized however that sports pitches also act as informal recreational green spaces with value for amenity and informal outdoor use. Any proposals to dispose of sports pitches should be subject to consultation with local communities, and require a determination by Council that these pitch spaces are not required as part of any other open space function.” [our emphasis]. There was no community consultation apart from the style of potential buildings. The space is most definitely being used for another open space function and has been for a very long time. One reason given for building on this site is that a small part of the receipts received from its sale (some 10% approx) will help finance the proposed development of an upgraded football pitch at Queen Margaret Drive. However, as mentioned above, there are also many Brownfield Sites which once sold could provide sufficient finance for the Queen Margaret Drive pitches. This issue was raised at the North Kelvin Community Council Meeting in February 2011. The representative of the developer, New City Vision Ltd (NCV) was asked why they were being directed to build on a greenfield site. No satisfactory answer was given. It’s not in the best interest of local children’s health and wellbeing that they must sacrifice one well-used Open Space in order to simply upgrade another open space that is also well-used i.e. it’s an overall reduction of open space resulting in an overall decrease in the range of activities young people can get involved in. Its use as a Playing Field became limited following the destruction of the goalposts and Local Authority (LA) neglect. Council records state that from 1993 the land was surplus to their requirements and should be left unmanaged until a new function was found for it. There are now 30+ foot trees growing out of that ex-playing surface. It can clearly no longer be designated as a Playing Field. Current specific uses of the North Kelvin Meadow, all of which would be destroyed if housing was built on it. Note none of which has been at the expense of the public purse. An awarding winning project that has successfully brought kids outdoors to experience learning in a natural environment which is part of the Woods for learning strategy policy. This site serves to fulfil this policy remit of having areas where kids can learn in woodland settings. Importantly it is also within easy walking distance of where many kids live and provides an area for unstructured play as well. The Children Wood project puts on a whole hosts of events for kids throughout the year. It also links in with many of the schools and nursery groups in the area who use this land too. More details can be found on their website http://www.thechildrenswood.com . Note it’s an ideal place for kids activities what with the Scout Hall across the road and car restricting measures on Clouston and Hotspur street. “…Traditional ideas about classroom teaching are giving way to new and exciting approaches, like the use of woods for learning. Woodlands provide a rich resource for a range of learning opportunities that can help deliver Curriculum for Excellence. They provide a unique environment for young people to learn about sustainable development and climate change….By walking to a woodland and being active once there, pupils gain health and wellbeing benefits. Woodland settings also provide a calming learning environment for those children with attention deficit issues or support for learning needs. Roseanna Cunningham, Minister for the Environment and Adam Ingram Minister for Children and Early Learning. A Scottish Pre-school Play Association registered outdoor playgroup runs on a Wednesday morning. There is also a Friday and Saturday morning group too. It is also used as part of the Forest Schools initiative, again under the Woods for Learning Strategy. Independent research has shown a clear link of improved educational performances of children given outdoor teaching and contact with wildlife. There are currently 35 raised bed allotment. 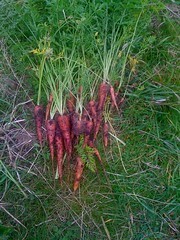 With an 8 year waiting list for an allotment in the area, demand is high for this healthy sustainable activity. The allotment provision in the North and North West of the City actually decreased after 1990 due to the approval of house building on a section of Kirklee Allotments. A similar resolution was passed by Kirklee Allotment Association (KAA). It is also worth noting the opinion of John Swinney (16th November 2010) “…the approval of Scottish Ministers is required if a local authority wishes to dispose of land…which forms part of a common or open space or is held for use as allotments. 4. Community Allotments and Community Orchard. Some members prefer to work communally, similar to the community gardens in Woodlands Community Garden (www.woodlandscommunitygarden.org.uk). There are two large community raised beds. There is an Orchard of 25+ fruit trees and bushes along the Kelbourne street fence line. 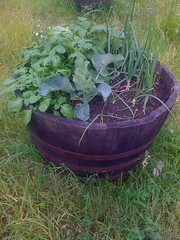 There are 7 compost bins which the local people give their left over vegetables and fruit to. Much better than it ending up in landfill. 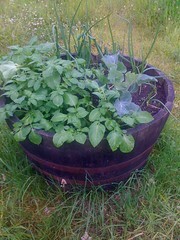 It’s also used to grow the vegetables and fruit in the raised beds and community Orchard. Which doves tails in with policy on sustainability. The above needs official support rather than opposition. Please amend the Local Development Plan within the City Development Plan to show this site as Green space and not labelled for Housing development. What follows was written in 2012 and refers to the 1st Phase of the planning application objection process. The planning application by developers New City Vision to build 90 properties on the Meadow was received by the Council in Dec 2012. The North Kelvin Meadow campaign along with many hundreds of residents want to see these plans for development of the Meadow firmly rejected. (Update: The North Kelvin Meadow campaign submitted a detailed objection document to the Council’s Planning officer detailing our arguments against granting of Planning Permission. You can download the document here (8MB Word .doc)). To make it is easier to object to the planning proposals, we have produced a standard letter containing some of the main reasons why the proposal should not be granted planning permission. The deadline for these objection letters was 1 January 2013. Anyone anywhere is allowed to send in an objection. All you needed to do was copy and paste the text into a new email, insert your name at the bottom and send to planning.representations@drs.glasgow.gov.uk It’s entirely up to you if you include your street address if sending by email however you must quote the Planning Ref number 12/00924/DC in the subject header of your email. If you’re going to print your letter out and send it by letter then please sign it and include your address. You are very welcome to change this standard letter, or to add some words from the heart about why you want to save the Meadow, and what it means to you. 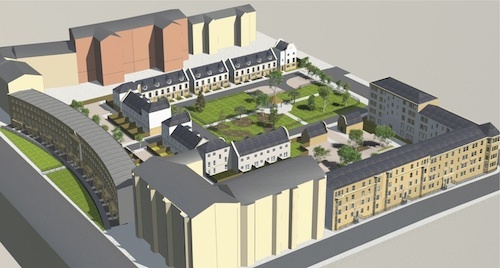 I am writing to object to the Planning Application lodged by New City Vision to develop housing on a site at Kelbourne St / Sanda St / Clouston St, Glasgow (ref: 12/00924/DC). This land has never been built on. It is not a brownfield site, nor a gap site, nor in a state of disrepair as described in the planning application. Since 1993 when the Council stopped maintaining the site as sports pitches, the land has been used as a community greenspace, and now consists of grassland and 480 trees, many over 30 feet high. It is currently used for a range of activities including childrens’ educational and recreational events, allotments, a natural habitat, a local composting facility, a community garden and dog-walking. The site was a finalist in the Best Environmental Award category of the Evening Times Streets Ahead awards in June 2012 and has also won two awards from Beautiful Scotland. City Plan 2 designates the site as ENV1 (Protected Open Space). The Planning application by New City Vision does not address the designation of the land as ENV1. This must be addressed and an argument made for the development of a protected open space. The development is contrary to this policy’s “strong presumption in favour of the retention of all public and private green/open space.” The North Kelvin Meadow is defined on the Glasgow Open Space Map as a sports area. This simplistic definition is considered to misrepresent the multi-functional nature of the open space. Although historically a blaes playing field, the meadow has long since been re-colonised by nature and now functions as: a semi natural greenspace (8); a wild playspace for local children (4) and a community growing space (6). The Housing Land Audit designates the site as New Build on Greenfield in an Urban setting, yet City Plan 2 (ENV 12 Development of Brownfield Land and Contaminated Sites) sets out that housing development on brownfield sites is preferable to greenfield sites. The site was formerly a playing field which is a greenfield land use. The site has since been re-colonised by nature but is most certainly not a brownfield site. The City Plan policy team is not listed as consultees on this planning application. Given that the proposal concerns land designated as ENV1 they should be. ENV1 requires that like for like compensation is provided where open space is to be developed: “equivalent or higher quality open space to directly replace the type of open space that would be lost”. This land is not designated as sports pitches under ENV1 and yet the Council is proposing to compensate the community by the provision of improved sports facilities on Queen Margaret Drive. The Council should instead compensate the local community with the type of open space that would be lost: greenspace, a natural habitat, a wild play area for children, allotments, an amenity greenspace, a communal garden. 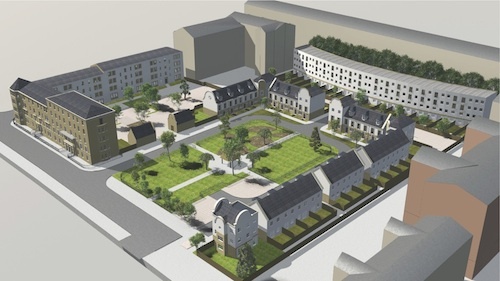 The proposed development will degrade the adaptability, success, sustainability and vibrancy of the North Kelvinside area through the destruction of a valued greenspace which currently provides opportunities for passive recreation, outdoor education and community growing. It will also cause the loss of biodiversity. This is counter to the Council’s policy STRAT 1 – Design and Sustainable Development in City Plan 2. The proposed development may have an adverse effect on existing habitats protected in law, international conventions or agreements or which are identified as a priority in government objectives, the Glasgow LBAP or are important because of their conservation status. Ecological surveys carried out to date have not demonstrated that the development will not have the adverse effects described above, or that: there will be no fragmentation or isolation of habitats or species as a result of the development; the development will is sited and designed to minimise adverse impacts on the biodiversity of the site (including its environmental quality, ecological status and viability); and public benefits at a national, or city region wide level, clearly outweigh the value of the habitat for biodiversity conservation, therefore the proposed development is contrary to ENV 6 Biodiversity. The proposed development causes the loss of trees on Council owned land in a conservation area (in direct contravention of ENV 8 Trees, Woodlands and Hedgerows) and it has not been demonstrated that: the public benefits at the local level clearly outweigh the value of the habitat; the development has been sited and designed to minimise adverse impacts on the biodiversity of the site, including its environmental quality, ecological status and viability; and all mature trees affected have been, or will be, surveyed for bats prior to the granting of planning permission. The community will lose a valuable resource if the land is developed. Although the Council is proposing to invest approx. £1m from the sale of the land in sports facilities for the local community, there is a significant shortfall between the value of the land (between £5m and £10m) and the benefit provided to the local community. The Planning system is supposed to allow for the representation of the views of the local community. I am concerned that the Council is disposing of land designated as open space in order to benefit from the price of the sale. The community will not benefit from the sale, as we will lose a valuable and well-used greenspace, and we have no right of appeal. During the Pre-planning consultation process significant concerns were raised by the local community about the size, scale, position and layout of the public open space that was proposed as part of the development. It was strongly felt by a majority of the local community that the open space was too small, too manicured, and that the position of the open space made it seem to be private space, for the use of residents only. Not only has the new design not addressed these concerns, but it has actually made the situation worse. The new design has reduced the area of open space available. The developer has not put forward plans for the ownership and management of the open space within the site. This is fundamental to the ongoing use and success of this space. 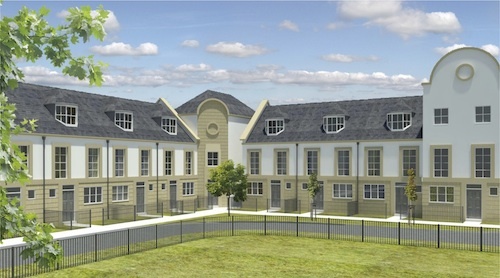 The development includes no social housing, in contravention of the Council’s Social Housing Policy. DES2 states that any development should protect existing biodiversity and compensate for any unavoidable loss. No compensation for the loss of biodiversity is proposed. The site supports a range of habitat and wildlife, and provides an important green network corridor between the River Kelvin and Dawsholm Park, the Canal and Ruchill Park. The proposed development conflicts with other Council policies and strategies including the Strategy for Outdoor Learning. Currently the site is used for a range of educational events and activities for children, including a regular pre-school play group that is part of the Scottish Pre School Play Association. 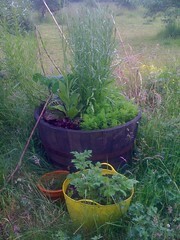 Other local nursery groups also regularly use the site. An established Forest School Group is also using the site, in conjunction with four local schools. The change of use of the land from a protected greenspace to a housing development would change the character of the area, which is supposed to be protected by the Conservation Area. The planned development fails to maintain the layout characteristic of the area, introducing a completely new layout and block structure to the area. Listed buildings border the site and the impact on them has not been addressed. The proposed development would significantly affect these buildings, and the view of them. 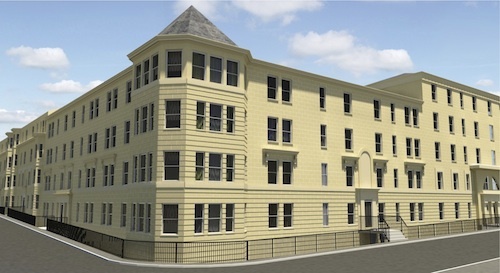 This development brings a completely new pattern of ‘mews housing’ to the area. Mews are small buildings dotted along the lanes behind townhouses and occasionally tenements. 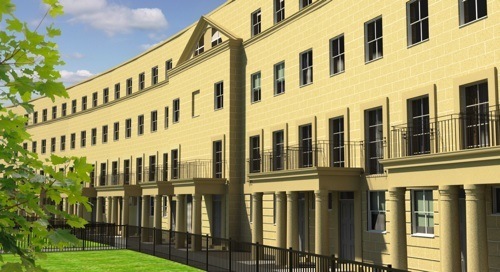 The mews in this development form a continuous terrace and dominate the site. There is nothing like them currently in the area. The development brings a completely new block size, pattern, building depth and layout of the block interior to the area. This is detrimental to the character of the area. There is no precedent for a 2.5 storey mews house in the area. The new sewers planned for this development will flow into the existing combined sewers. These sewers already overflow and deposit raw sewage on the Kelvin Walkway regularly because of the strain on the sewer infrastructure in the local area (these incidents have been reported to Scottish Water). The additional strain placed on the existing system by the surface water and foul sewer from 90 housing units will exacerbate this problem. The plans show that the surface water run-off will be directed to the corner of Sanda and Kelbourne Streets, an area that already suffers from flooding problems. The land currently acts as a sink for rainwater, if developed this advantage would be lost. No account has been taken of the cost of upgrading the sewage system that would be required by Scottish Water in order to meet the increased demand. The plans for drainage and surface water should be approved by planning officers with this specific remit. These are not marked as being consultees on this development. The proposed development proposes to provide parking for the site on Clouston Street, Sanda Street and Kelbourne Street. These streets are currently fully used for parking, and no additional space is available. The plan takes no account of the effect on traffic of the barriers (bollards) on Clouston Street which will impact on the flow of traffic, causing severe strain on the roads that filter into Queen Margaret Drive. The main flow of traffic to and from the site will go past a children’s play park. A Right of Way currently exists on the site, and this has not been accounted for within the development plans. The plans should retain this Right of Way. The current infrastructure capacity of the local area regarding schools, General Practitioners, roads and sewers has not been adequately considered. A development of 90 housing units will place additional strain on local amenities and this has not been considered. Especially with the other nearby housing developments that are currently in progress or just finished e.g. the ex school site between Maryhill Road and Oban Drive and the ex petrol station site on Queen Margaret Drive. The Tree survey carried out by the developer significantly underestimates the number of trees on the site. We count more than 480. The ecological assessment that has been submitted as part of the Planning Application refers to additional work that needs to be carried out in order to fully document the species that are present on the land. This work has not been carried out. Also the preliminary ecological assessment was conducted at a time of year when species are inactive. The character of local housing is one of bay-windowed tenements with deep undulating facades. The extremely flat facade of the townhouse section looks out of place in its architectural context. There is no historical precedent for the townhouses to have a flat roof. The townhouse element of the design is not sympathetic to the character of neighbouring buildings in this Conservation Area. These images are taken from New City Vision’s Planning Application and give a good idea of the scale and design of the development. The Glasgow City Council planning portal has been periodically unavailable over the last few days so we have reposted the key documents from the planning application here. They are reproduced without any amendment. We will organise this shortly into a more logical list. Some other sources of information that might help in forming an objection. “there are enough houses where i live, but not enough GREEN. the playgrounds are boring and you can climb trees, get fresh air, walk dogs, run, ride your bike, be with lots of friends and feel save in the meadow. please don’t destroy our meadow.” stina fisher, 8 years old. What a pointless proposal! Come on Glasgow, don’ t let us down. Good luck! These green spaces are so precious!